Some arid mud flats in central-western Western Australia are dotted with thousands of little mounds of clay. These are the nest entrances of the fascinating Dawson's Burrowing Bees. 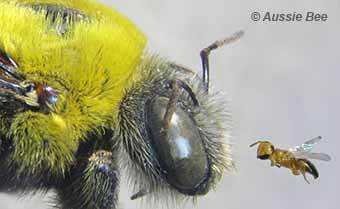 The crowded lives of these bold native bees have attracted international scientific interest. 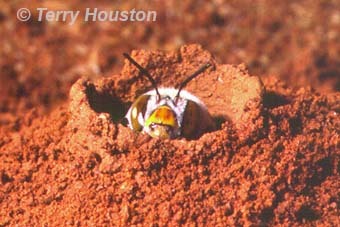 Above: a female Dawson's Burrowing Bee peeps out of the entrance to her nest burrow in an arid WA clay pan. Photograph courtesy of Dr Terry Houston, Western Australian Museum. New adults emerge from the nests in late winter or early spring. Competition for the favours of the new females is incredibly fierce and violent battles ensue. David Attenborough captured spectacular footage of the Dawson's Burrowing Bees for the BBC series LIFE and scientific studies by Dress Terry Houston, John Adcock and Leigh Simmons have revealed intimate details of the lives of these amazing bees. 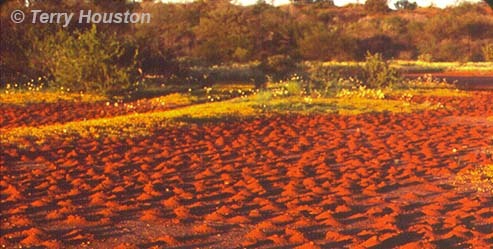 Above: part of an extensive nest site of the Dawson's Burrowing Bees in Western Australia. Photograph courtesy of Dr Terry Houston, Western Australian Museum. The Dawson's Burrowing Bees, Amegilla dawsoni, are up to 20 mm long, with yellow face markings and a smooth red-brown abdomen. Females have dense white fur on their thorax while males have pale tan coloured fur. They belong to the family Apidae. The following fabulous photos by Linda Rogan show a female bee emerging from her burrow, and two males competing for the attentions of an emerging female. 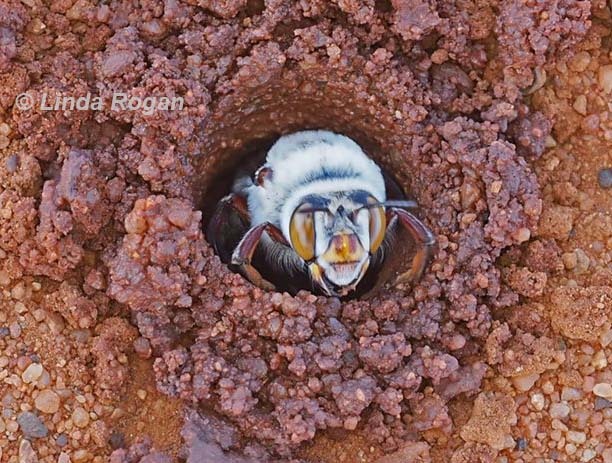 Above: Linda Rogan captured this great photo of a Dawson's Burrowing Bee female just coming out of her nest in WA. 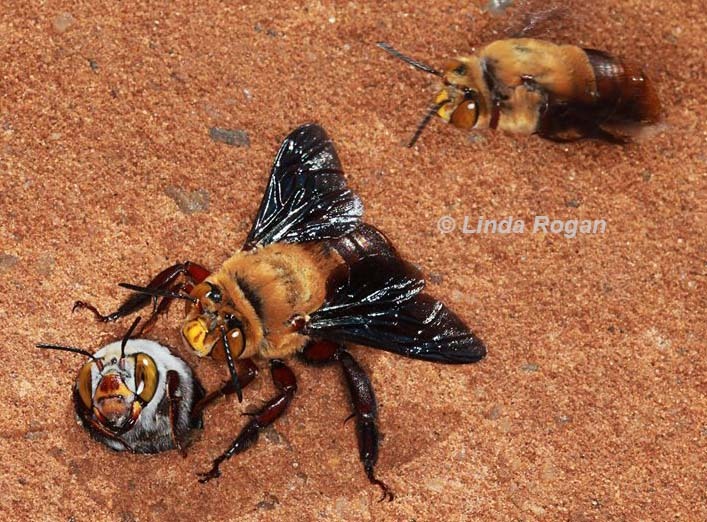 Above: two male Dawson's Burrowing Bees zoom in on an emerging female bee, in another superb image by Linda Rogan. More Photos of Native Bees.